IrishTrucker - For the best effect, use Reflect! For the best effect, use Reflect! In just six years, Reflect Auto-Care has become Ireland’s premier supplier of professional vehicle cleaning products. As well as providing a nationwide service, the Dublin-based company is also making inroads into the Scottish market. The professional’s choice for vehicle cleaning supplies, Reflect Auto-Care continues to go from strength to strength under the direction of husband-and-wife Gary and Lorraine Meaney, who founded the business in January 2012. Reflect Auto-Care has become a leading specialist in auto cleaning supplies by providing valeting companies, truck and bus fleets, car hire and dealerships with high-quality, low-cost products, with a service that is second to none. The Reflect Auto-Care team take the same pride in their cleaning and valeting products as the successful fleet owners do in keeping their vehicles spotless. The company grew out of Gary’s passion for vehicle cleanliness. “I used to drive a truck and was known for keeping it in mint condition,” he says. From humbling beginnings in Swords, Reflect Auto-Care relocated to the Millennium Business Park in Ballycoolin in September 2014. Such was the company’s rapid growth that it subsequently moved to a larger premises and also opened a second warehouse, both of which are located in Millennium Business Park. Opening hours are from 8am to 5.30pm Monday-Friday and from 9am to 1pm on Saturdays. Reflect Auto-Care employs nine staff at its Dublin HQ and also has distributors who cover the four corners of Ireland as well as Scotland. Head office has four vans covering counties Dublin, Meath, Louth, Kildare, Carlow, Cavan, Sligo, Mayo, Roscommon, Leitrim, Galway, Longford, Westmeath, Offaly, Laois and Tipperary. Ray Fenlon looks after customers in the Wicklow / Wexford / Waterford region, Brian Mongey covers Cork, Kerry, Limerick and Clare. Ciaran Molloy of Molloy Fuels in Dungannon is Reflect Auto-Care’s representative in Northern Ireland, covering counties Antrim, Armagh, Down, Fermanagh, Derry, Tyrone and Monaghan. GMB Sales is our new distributor for Reflect Auto Care products in Donegal while Steven and Claire Winton are agents for Scotland. “I knew Steven from the truck show scene,” Gary explains. Reflect Auto-Care’s products are used by more and more people every day: “Truck and van owners have become very particular about the appearance of their vehicles. A vehicle that’s clean and looks well gives a good impression and will almost certainly earn more business for their company than one that’s covered in dirt. Because our products are the best on the market, our customer-base is constantly growing. A huge range of cleaning products, accessories and equipment from leading manufacturers are available from Reflect Auto-Care. The company is the sole Irish distributor for Image Chemical Products and is also an agent for White Diamond and Vikan. Everything from shampoo detergent, gloves, cloths, sponges, workwear, tar and vacuums/hoovers to pressure washers and foaming lance systems are stocked. 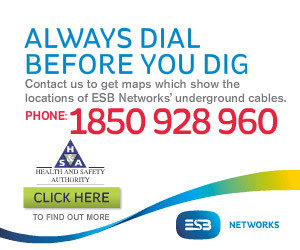 “We stock more than 500 products to save our customers time and money,” the affable Dubliner says. “Among our best-selling products are Pink Quick Clean, which is Image Chemical Products’ flagship cleaning product, Shampoo, Hi-Foam TFR, Super Strength TFR and Iron X. Our own range of products include Wash + Wax, Citrus Pre-Wash, Super Cold Wax, Tyre Reflect and Fabu Clean Upholstery Cleaner. We launched a new product called Reflection Quick Detailer at last year’s Full of the Pipe Truck Show, which is going really well for us. We also have a number of new products to be launched exclusively at this year’s Full of the Pipe Truck Show. Gary is a familiar face at all the major truck shows, including Full of the Pipe, Waterford and Dualla. 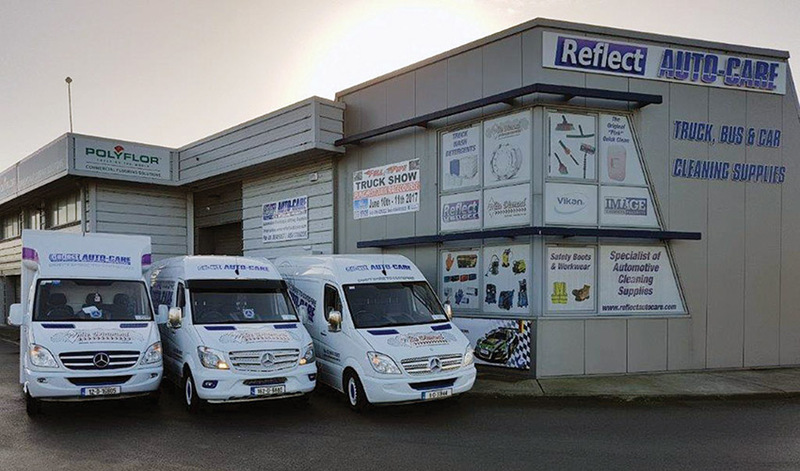 He is pleased to announce that Reflect Auto-Care will once again be one of the main sponsors at the Full of the Pipe and Dualla Truck Shows this year. Full of the Pipe takes place at Punchestown Racecourse on June 9 and 10, while Dualla will be held on August 26 on the grounds of Ballyowen House near Cashel in Co. Tipperary. Gary presents the Jimmy Meaney Memorial Cup to the overall winner at the Dualla Truck Show each year. Also known as the ‘Reverse Cup’, it commemorates Gary’s late father and his ability to reverse his truck and trailer into incredibly tight spaces.